As a child I remember reading the Wind on Fire ‘trilogy’ and being fascinated by the concept of large vessels sailing across the land. Now it is a reality (albeit a much smaller craft). 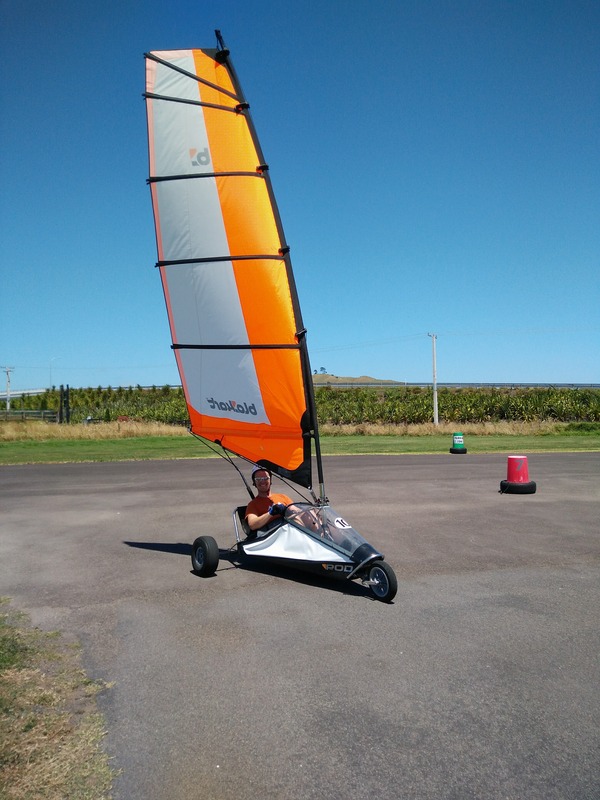 One man buggies, complete with a single sail race around a set course harnessing the wind power to pick up (what felt like) an incredible pace. I was surprised to find, that unlike sailing there is less to initially learn. There was no need for knowing any nautical terms, just three basic rules: Let go, Let go, Let go. Let the rope go if the kart is going to fast. Let the rope go if the kart lifts up onto two wheels. After our safety briefing we wandered over to the course and got acquainted with our karts. The karts are operated using a rope to tighten or loosen the sail which is held in one hand, whilst the other steers the craft using a tiller. Being the only ones booked in, we had the full run of the track allowing us to race each other, perhaps just a little competitively. We found ourselves bending the golden rule and allowing the kart to tilt onto two wheels. This gave us that little extra speed, giving ourselves a small margin of victory over the other person. At one point this went a little too far – resulting in an overturned kart. I was chided for not remembering the three rules and then quickly returned to three wheels to pursue Ian again. Land Karting is taking of all over the world, and is not exclusive to New Zealand. It something we would definitely look to do again!